I needed Roti. There's nothing more to say than that. They're not very easy to come by in Vancouver but in Toronto, there is a ridiculous supply. I went down to Queen West to see one that I had seen on Restaurant Makeover. 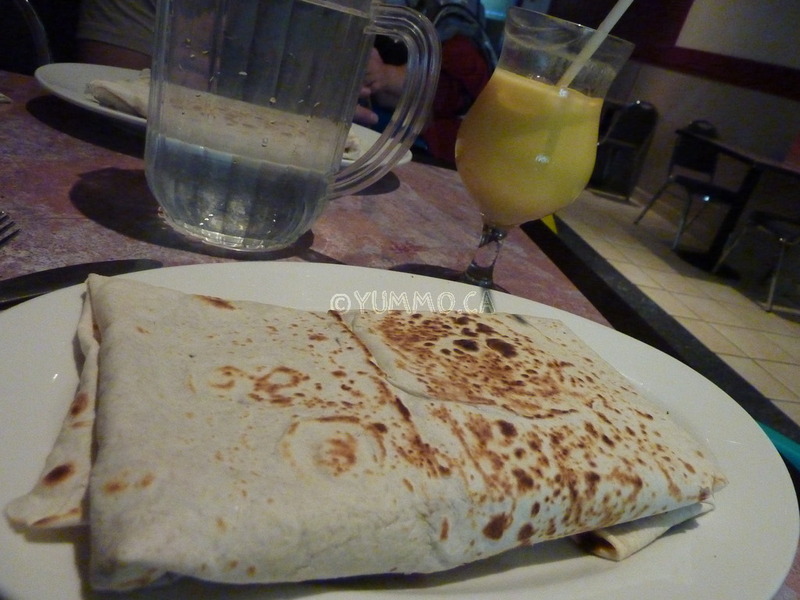 It had received really good reviews but was reputed to be quite a bit more expensive than the average in town, ~$15. Well, they were closed for vacation. I didn't need to worry because on that block in south Parkdale, there were at least three more. D wanted to try Ali's because there's a place he goes to regularly in Port of Spain with the same name, where he's working right now and he thought it was funny. I chose Mother of India because I'd read of them as well. After sitting and ordering, D mentioned he was surprised that I wanted East Indian style rather than West Indian because that was what I was craving. D'oh. I wasn't thinking that far ahead nor was I truly aware how different they'd be. The West Indian style is different both inside and out. Inside, the filling tends to be alot more stodgy, (dry and thick), the base is often Chick Peas and Potatoes. The wrapper is also quite different. The West Indian yummoriffic style is huge. When they've wrapped it all up, you see quite a few layers of wrapper around the filling. The wrapper is quite a bit more pliable and tender. It is lined with cornmeal which it's cooked and stretched on. The East Indian wrapper is more like a bready crepe. It's a bit drier and crisp. It tends to only be large enough to encase the filling. They're both amazing styles and you can be in mood for either or but they're quite different experiences. I was really craving the West Indian but here we were in Mother India. Thankfully, since it was East Indian based, there were alot more variety of filling. You could basically get any curry in a Roti. I chose the Eggplant which was like a spicy Baigan Bartha. mmmmmm D chose the Chicken Tikka Masala. I also ordered a Mango Lassi to wash it back. The decor is not worth mentioning. It was almost dismal enough that I was going to suggest takeaway but we were there and T didn't want back in the car just yet. It felt like a church basement both in lack of light, dropped ceiling and metal framed chairs with rickety tables. I don't think I would eat in again. That said, I would eat there again. The Roti were piping hot. Even though the server admonished me against spicy since it was 'indian' spicy, I wish I had ordered spicy. The medium was just okay in heat but I am not complaining. The Eggplant filling was plentiful very fresh, piping hot, not at all greasy and well seasoned. The Roti it self was quite large. D's Tikka was very good as well, there was a sauce which you don't always see if you order the dish but in a Roti I guess they do it differently. The sauce was bright, fresh and hot. We thoroughly enjoyed the food and the price. Bacchus at 15$ is like 40-50% more expensive. While we sat, there was a regular takeway flow. Even though the dark dining room sat empty except us and a creepy father and small girl who sat holding hands across a table. That's creepy right? Their conversation was oddly adult too, about plans for the coming long weekend and she couldn't have been more than 9. Anyhoo. I'll be back to that block to have more Roti or Dosa...mmm they had Dosa on the menu at Mother India. 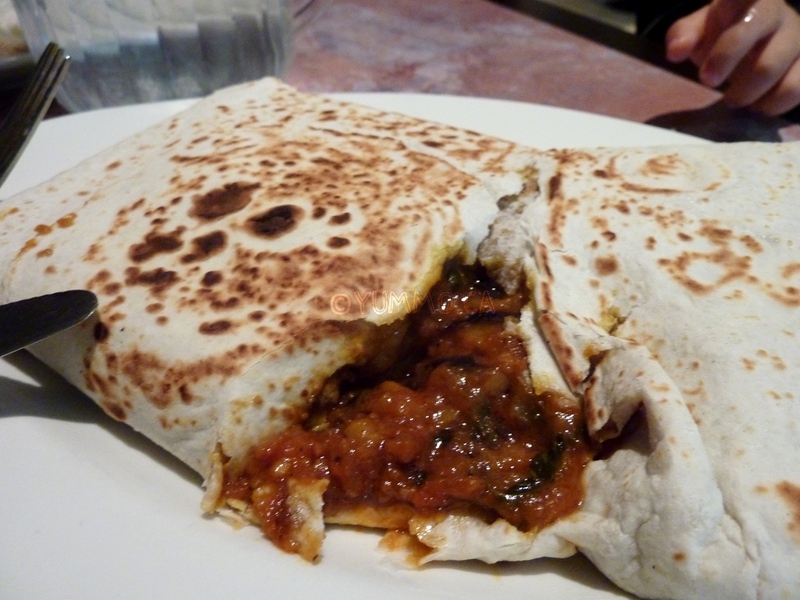 A paper thin crispy lentil crepe around a curry filling, southern. Ambiance: I would suggest takeaway. Church Basement. Clean but not cozy. Family Friendly: well, yes, the staff were cool, there was a dingy high chair, I guess.